But how much should you save? Saving too much or too little both have a painful side to it. While saving too little will push you to a penurious future, saving too much may mean you are not fully enjoying the present. A balance is what is crucial and that happens when you invest your savings according to a plan. “Just setting aside some money for future is not enough. You need to have goals in mind so that you can work to a plan. Chalk out your goals and set time periods for each of these goals, this will help you decide your asset allocation," said Shyam Sekhar, chief ideator and founder, iThought. 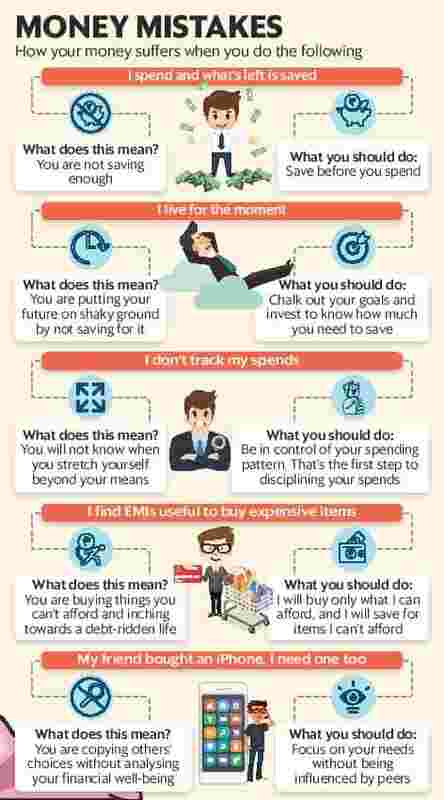 For example, saving for retirement is a goal most people will have and given that for most it’s a long-term goal, you need an investment corpus that can beat inflation and equity is your best bet. According to Priya Sunder, director, PeakAlpha Investment Services Pvt. Ltd, even short-term goals like spending on festivities should be planned for in advance. “Diwali definitely sees a spike in expenses as people spend 1.5 to 2 times their average monthly spends. But if one plans for this in advance, one can spend without disturbing investments or cash flows," said Sunder. “One can invest in liquid funds as they often provide returns that are twice of what a savings account gives and since the money is not in your account you don’t spend it either," she added. According to Suresh Sadagopan, founder, Ladder7 Financial Advisories, knowing where your money is going is key to understanding your spending pattern. “For most people their money life is sorted as long as there is money in the bank. Money troubles do not start only when there is no money left, it starts the day you are not able to figure out how your money is getting spent, this also means you are spending more on discretionary items," he said. Keeping a full account of where you are spending your money is important if you want to discipline your spending habits. “Most people dream of becoming a billionaire but actually what they really want is to spend like one and as a result self-destruct their dreams," added Sadagopan. Also, do everything possible to keep track of where your money is going. For instance, instead of using multiple bank accounts for different spends, use only one account or don’t use multiple credit cards. You need to stay humble in your financial life. But increasingly this virtue is getting tested at every nook and corner. Credit is now available on tap all year round: walk in to a retail outlet and walk out with a home theatre purchased on EMIs. Or simply cart it online on EMIs. What was unaffordable earlier is now within reach, thanks to easy credit, but remember it’s a vicious cycle. Future EMIs reduce your disposable income, putting pressure on your cash flows and pushing you further towards debt and a lifestyle funded by EMIs. “In the shadow of the festival, a lot of mistakes happen as people fall into the peer pressure and go overboard. This is a classic mistake. One needs to know that ultimately what’s affordable is what’s enjoyed over a period of time. It’s important to stay grounded," said Kalpesh Ashar, founder, Full Circle Financial Planners and Advisors. Of course following the herd is a source of great comfort: you are not in it alone, and neither are you being left out. But every household operates on different dynamics and that extends to their money lives as well. Copying, therefore, doesn’t work and it’s important to check yourself from aping spending and investing habits of your friends, colleagues and relatives. “Don’t buy because the sale is on and everyone is shopping or don’t buy gold because traditions demand you to. You need to review your needs, your cash flows and your investments to make these decisions. Such decisions can’t be borne out of a herd mindset, but for that you need to remove the clutter from your head and stay grounded," said Ashar. In fact, as per Sekhar, Diwali is good time to do something different. “Take action. If you have made mistakes, then work towards correcting it. Review your investments if you have never done that before, or take stock of your cash flows or understand your asset allocation or pay up your loans. Basically take small yet meaningful steps for a healthier financial future," he said.